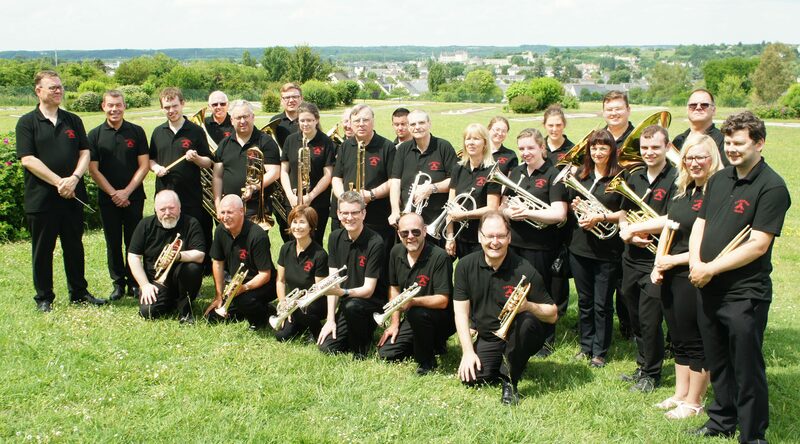 Saturday the 2nd June saw Carlton Brass take part in the 24th French Open in Amboise. This is a contest open to international entries; the band being drawn against competitors from France, the Netherlands, Norway, Jersey and a number of UK bands. This was the first time Carlton has entered this competition and our first trip abroad in over ten years. It is also the first time in living memory that we have competed against our (almost) namesakes at Carlton Main Frickley. The contest takes in three components – a March (very much like the Whit Friday Marches), a 25 minute programme that includes a test piece, and a 30 minute outside entertainment programme to a local audience. This all takes place in the medieval town of Amboise in the Loire Valley region of France. It is a very beautiful location for a contest, especially for the march and entertainment stages which are set in the shadows of the stunning Chateau d’Amboise. As lovely as Tameside and Saddleworth are this is a glorious location for a brass band contest. The first part of the contest – the March – seemed to be in the standard ‘Whit Friday’ format, with a march down to a contest location where a contest march is performed to an adjudicator hiding behind a barrier. We marched down to a rearranged version of Army of the Nile and then gave a super rendition of the old warhorse ORB. This was all done along a medieval street in front of hundreds of people sat in bars and cafés. That concluded our performances here, all done by 2:45 in the afternoon – leaving us plenty of time to enjoy the local food and drink establishments once we’d packed all our instruments away. It is fair to say that profits were definitely up that afternoon and evening along this medieval street in Amboise! The evening saw Carlton Main Frickley performing at a local venue for the results and gala concert. While we share a part of our name with Carlton Main they are in a different league. We are proud of our musical ability and are an excellent first section band, while Carlton Main are one of the best bands in the country, frequently competing with the likes of Black Dyke, Brighouse and Cory Band and have some very fine soloists in their ranks. Their gala concert was utterly brilliant! The results were given out mostly in French, and while we didn’t quite understand what was going on (or win anything) we were very pleased with both our performances and the reception we had from those listening to us. We came a respectable 4th in our section (beating last year’s champions Brassage Brass in the process) and achieved an excellent 7th overall in the March contest (beating one of the championship section bands). The big success for us as a band was the amazing time we all had in Amboise. The whole trip was an absolute hoot, from the bus journeys too and from France, to the ferries, and the stay at the Ibis Budget Hotel in Amboise; we got to spend three days or so among some fantastic people and we all had a huge amount of fun. Special thanks must go to our guest players that filled in for the few of our band that couldn’t make it. Rich Walker, Emma Ramplin, Ian McCormick and Luke Atkinson – thank you for coming along and being part of our brilliant band for this trip. Big thanks also to emergency percussionists Neil Smith and Danny Stevieson who really helped to put in some of those extra percussion parts in Tyrfing – you were fantastic. You are all lovely people and we loved spending the trip with you. Huge thanks must go to our chairman Clive Brocklehurst. It was his idea for this trip, and he has put in a colossal effort in organising it. It’s a difficult task getting a whole band to agree to such a trip, but he has been the driving force behind the whole thing. We wouldn’t have gone at all without his vision and guidance. We were also lucky to have Della Pearce and Andy Allison dealing with all the contest paperwork and finances, respectively – big thanks to you two also! Everyone at Carlton Brass put in a big effort at rehearsals and we did ourselves proud in Amboise. Our wonderful MD Gary Wyatt created a powerful musical performance out of us. Everyone has tried so hard and the efforts are showing rewards. Well done to everyone that has taken part – we should do all this again! 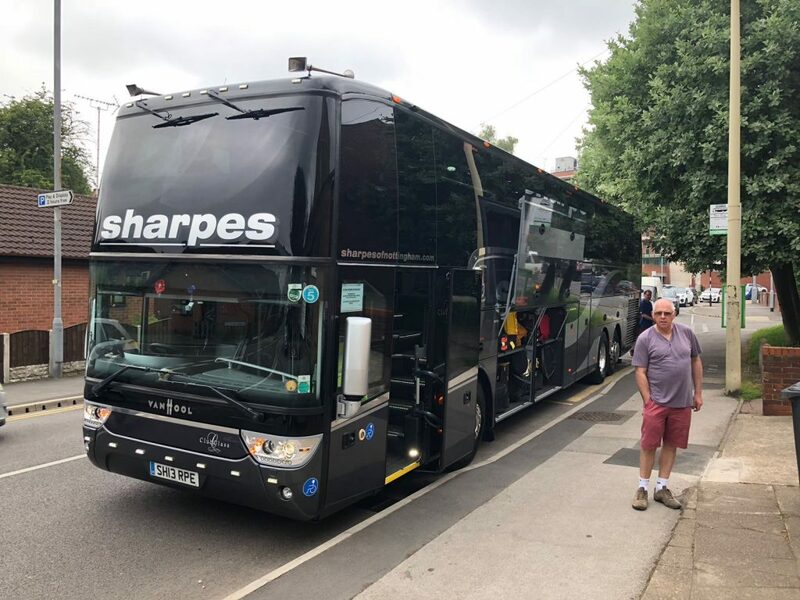 Sharpes of Nottingham provided our luxury transport to and from Nottingham. The coach we had was so comfortable and made the long, long trip to Amboise a joy. Thank you! Our drivers were brilliant, especially graham in France who was so helpful and knowledgable. Those narrow streets were pretty tricky to get around and he did a great job of making sure we were able to get where we needed to be. A gallery of images from our trip will be available soon.